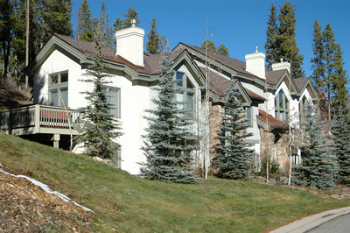 Located on the slopeside of Breckenridge, Highlander townhomes for sale will greet visitors with a sheltered place to park, great views of Baldy Mountain, plenty of sun in the roomy living area, and the Snowflake Lift down the street. Near the free bus route, Highlander Townhomes are just a short walk, downhill, to the center of town. Built in the 1990’s, Highlander, Breckenridge, CO exemplified the Third Wave of ski condo style, as it evolved: lots of geometric windows, usually crowned with triangular ones, vaulted ceilings, small but multiple decks, and finished on the exteriors with stone accents. Highlander Townhomes are part of the Upper Village Homeowners Association and anyone who owns a Highlander Townhome has access to the community pool, which is located on Primrose Path. Read more about living in this Breckenridge community, or browse all the Highlander townhouse listings below. All Highlander Townhomes have at least three-bedrooms, and most are over 2-thousand square feet, have garages, radiant in-floor heat, and additional living space in the basement, which is not included in the square footage. The Highlander Townhomes are located between Kings Crown Road and Primrose Path and walking north on either road brings you quickly to the base of the Snowflake Lift. A block to the south is Beaver Run and another major chairlift to the top of the mountain. The ski resort is built on national forest, so in the summer there are trails and wildlife where there are ski runs in the winter. Size: 1802 sq. ft. to 2306 sq. ft. Amenities: close to Snowflake Lift, not far from Beaver Run, walking distance to downtown, near the free bus route, views, spacious, garages, access to Upper Village pool and clubhouse, in-floor heat. From the traffic circle on the north side of Breckenridge, continue on Park Avenue for 1.5 miles to Four O’clock Road, turn right, and just before the base of the Snowflake Lift, turn left on Kings Crown, the next group of townhomes on the left is Highlander. Do you have any questions about Highlander or other Breckenridge neighborhoods? Send us a message online to get all of your questions answered!